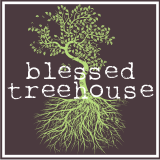 Blessed Treehouse: She's a maneater. Watch out boy she'll chew you up. My kids loved watching this, so I taught them the song! so funny. Harper, dosen't mommy feed you lol.